This page or section has not been updated in a long time, no longer applies, refers to features that have been replaced/removed, and/or may not be reliable. This page is only kept for historical reasons, or in case someone wants to try updating it. Kodibuntu is a combination Kodi/operating system for use on PCs that are mainly just running Kodi. It is an alternative to installing Windows or a larger (and sometimes more complicated) Linux-based OS. 3.3 How do I upgrade the Kodibuntu base OS? x86 or x86-64 processor such as: Intel Pentium 4/ Pentium M, AMD Athlon 64 / Opteron, or newer CPU (that support SSE2, which all CPUs made within the last 10-years does). Recommended: 1GB or more in a HTPC media player appliance-like computer dedicated for Kodi, and 2GB or more in a computer for multipurpose use. Kodi will run on most graphics cards made within the last 10-years or so, though for good hardware video decoding support a little newer graphics cards can be required. This includes most cards from AMD/ATI, Intel, or NVIDIA which support OpenGL 2.0 or later. For hardware video decoding, which may be necessary on low-performance CPUs to playback 1080p content, make sure your GPU or VPU supports either VAAPI or VDPAU. For everything but older AMD cards and Nvidia, VAAPI is recommended. On AMD, you might have to start with the environment variable KODI_GL_INTERFACE set to GLX in order to get VDPAU support. The Kodi application generally only takes up between 100 to 200 MB of space, depending on how the binary is compiled. Technically speaking, if your hardware supports netbooting, you do not even require a internal storage for either the operating-system or for Kodi. Depending on how big your video library is. Most of the space required for Kodi comes from the images/artwork cache, which can be adjusted: HOW-TO:Reduce disk space usage. 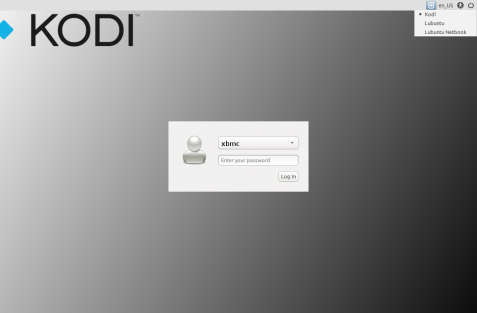 Kodibuntu comes in an ISO form that can be written to a USB drive or burned to an optical disc. Kodibuntu has only one iso image file for all x86 computers, regardless of GPU. Currently, only a 64-bit version is available, but this should cover the vast majority of users. Current Kodibuntu is based on a LTS release (long term release) which is supported for 5 years, this means that it isn't required to upgrade the OS base in order to obtain updated or upgraded application packages. See Current Ubuntu releases if your current distro is listed under End of life table, you will need to upgrade your OS to a supported release. To actually upgrade the underlying Linux which "Kodibuntu" is based on, it is possible to do so via release upgrade. There are advantages and disadvantages to doing so. It's not a method recommended lightly to inexperienced users, doing so means you understand and accept responsibility for breaking your system. BACKUP! Never attempt any upgrades without having proper backups of the files you consider important or value or have a full system image/backup of working system you can restore. This should upgrade your Base distribution, however if your current version is too old it may require repeating these steps until you reach the desired version. Do note that this is not recommended to inexperienced Linux users in case of breakages that you wont be able to resolve. Kodibuntu can boot directly into Kodi or it can also boot into a desktop mode for using applications such as a web browser. Step 2: Select Lubuntu and enter your username and password. The username may differ from the one you supplied during installation. So please be aware, that "xbmc" (as shown in the screenshot) might not be the username you will see and/or have to use. Note: If you last booted directly or switched to desktop and shutdown the HTPC while in desktop, on next reboot you will get the last used session by default. To return to Kodi, logout, select Kodi as session in the top-right pulldown menu and enter your username and password again. To login to the command line interface press Ctrl+Alt+F1 - F6 or connect over SSH by using usernamne and password supplied during installation. Note: For the use of Ctrl+Alt+F1 - F6 no username and password is required. You are logged in directly to the command line. 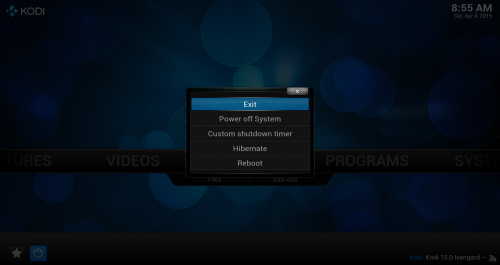 Kodibuntu contains Kodi for Linux compiled with the 'standalone' mode, this enabled certain functions that are not available in normal Kodi installations (Windows, Mac Linux), these functions include Power Management, and Network Management. Chromium is included for web browsing and can be found in the start menu. In Systems / Package Manager tools - you can install other applications for your specific needs. Test connection by running manual start command. # description "Start x11vnc at boot"
This page was last edited on 10 July 2018, at 03:14.